Dodson was never a very large town. It was a railway stop, although the actual station was physically moved several times. No reasons I can find why it was moved or even when. Lewis MacArthur mentions this fact in Oregon Geographic Names and leaves it at that. The town doesn’t even seem to ever have had a post office. Most likely citizens got their mail from Warrendale (where the Dodson train station physically was at one point,) or at Bridal Veil. What we do know is that the town was named after Ira Dodson who claimed 80 acres here. We also believe that Lewis and Clark had a hunting camp at Dodson April 7-9th 1806. The hunters were apparently unsuccessful having found that all the elk had been scared away by the natives. I believe that the local indians probably did this to protect one of their other major food sources – Camas which grows heavily through this area of the Columbia River Gorge. 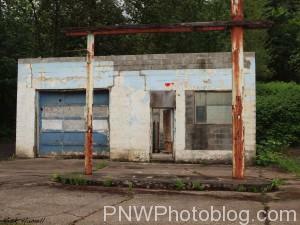 Along the Old Columbia River Highway are these two old buildings, an abandoned gas station, and a hotel. 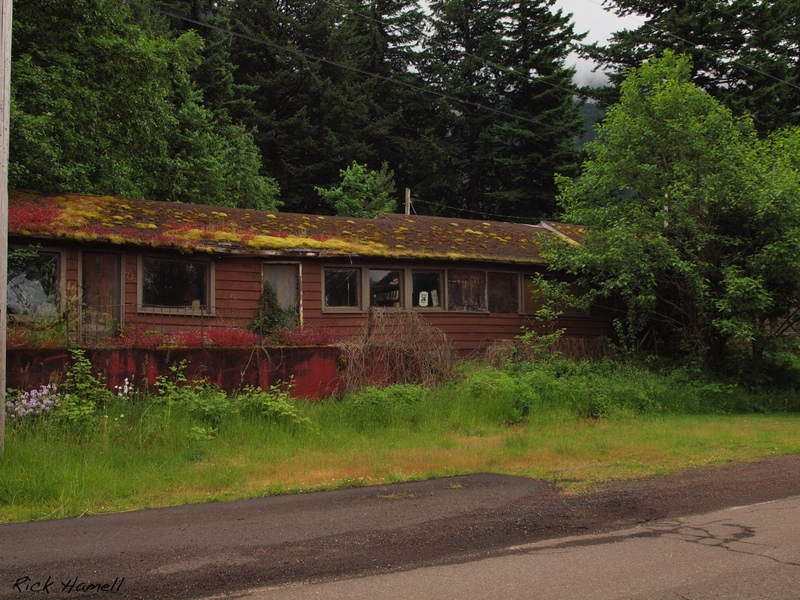 Both seem to date from the 60’s and probably went out of business when the new Columbia River Highway was built. There are houses behind the trees here, about a dozen or so, but the roads are all dead ends now even though maps say they go through. Most recently a massive landslide took out a farmhouse in 1996. The entire area is so over grown now that you can’t tell there ever was a landslide. nice blog, very interesting. I live in Washington and remember when I was a kid my Dad, a history teacher, would take family to ghost towns in Eastern Washington. It was very memorable. Thanks for stopping by Jason! I’m definitely working on Washington towns also, you can check them out here: http://pnwphotoblog.com/ghost-towns-washington/ It’s pretty empty right now, but I’m slowly working on it! I actually lived in Dodson in 1971 and 1972. A friend and I rented a house there. The store was fully functioning but the gas station was out of service. The motel was in service to and we knew the couple who ran it. They closed down that January of 1973.There were still families there at that time. Thanks for stopping by Sue! That hotel looks worse every time I drive by it. Too bad its not open still, I believe it’d be a great place to stay. To funny, as a small child in the 70s, remember going down the hill from grandmas house to buy penny candy at the store. My grand parents lived in the 3rd house from the top of the hill, there is also an old school building at the top that had been made into someone’s home. My grand parents live there from my earliest child hood memories, I was born in 1970, they sold the house just after the landslide in 1996. You never hear about the other victims of the slide because it wasn’t dramatic. We knew the Royces very well, as a child I spent plenty of time playing at there home when their grand daughter would visit. My parents were running the store, gas station and cafe when I was a kid. Drurys Dodson Service ring a bell? I’m pretty sad about the recent fire. not so sure what will be left. I wonder if the hotel has a free continental breakfast? All jokes aside, it would be interesting if there were records of the last owners of the hotel and when it was open for business, etc. 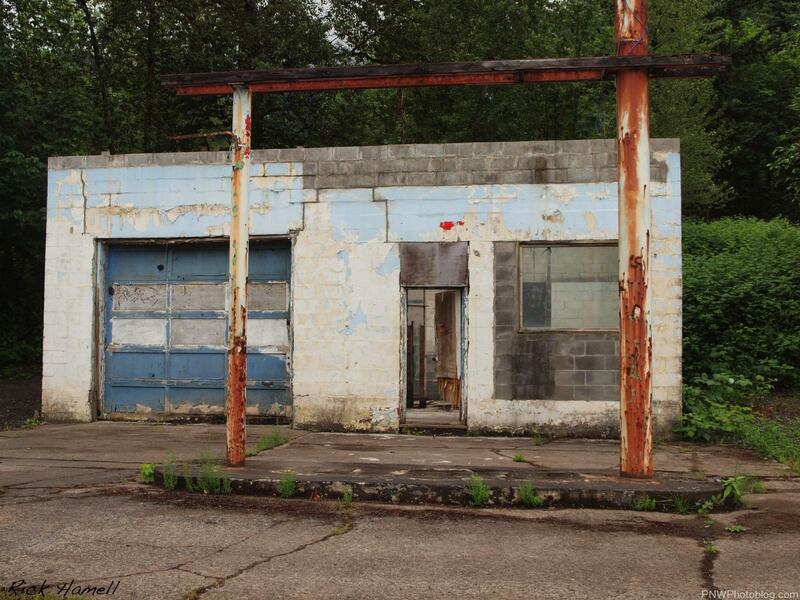 I grew up in The Dalles and while driving back and forth to Portland, you can’t help but notice this building, just east of where Mitchell Point Tunnel once was.